Unacceptably high rates of maternal morbidity and mortality affect the Global North and the Global South. Among many challenges, policy-makers and researchers cite concerns about quality of care, respectful maternity care, and implementation of evidence-based strategies and national guidelines at the frontlines of the health system. Informal payments are one concern that cut across these three challenges; they represent poor quality care; they are often experienced as disrespect by patients; and, health care worker demands for such payments by definition conflict with national policy. Social accountability and legal empowerment are two approaches that are increasingly used to address quality of care concerns in maternal health and poor implementation at the frontlines of the health system. This dissertation is comprised of three chapters (papers), all of which focus on these challenges in maternal health in low and middle income countries (LMICs). They apply concepts and methods from health policy and systems research (HPSR) to undertake theoretically-informed analyses that straddle two fields: (1) accountability, and, (2) global maternal health. The first chapter is a critical interpretive synthesis that summarizes the evidence base on the prevalence, drivers, and impact of informal payments in maternal health care; critically interrogates the paradigms that are used to describe informal payments; and, finally, synthesizes the policy and funding debates directly related to informal payments. The paper finds that though assessing the true prevalence of informal payments is difficult given measurement challenges, quantitative and qualitative studies have identified widespread informal payments in health care in many low and middle income countries in Asia, Africa, and Latin America. Studies and conceptual papers identified both proximate, immediate drivers of informal payments, as well as broader systemic causes. These causes include norms of gift giving, health workforce scarcity, inadequate health systems financing, the extent of formal user fees, structural adjustment and the marketization of health care, and patient willingness to pay for better care. Similarly, there are both proximate and distal impacts, including on household finances, patient satisfaction and demand for health care, and provider morale. Despite the ground level relevance of informal payments, they are generally not adequately addressed in global policy frameworks and strategies, or in standard metrics of health system performance. Though this absence does not necessarily imply lack of financial or other attention to informal payments, it makes inattention more likely, and regardless, represents a notable silence. Informal payments have been studied and addressed from a variety of different perspectives, including anti-corruption, ethnographic and other in-depth qualitative approaches, and econometric modeling. Synthesizing data from these and other paradigms illustrates the value of an inter-disciplinary approach. Each lens adds value and has blind spots. These attributes in turn affect the solutions proposed. The paper concludes that the same tacit, hidden attributes that make informal payments hard to measure also make them hard to discuss and address. A multi-disciplinary health systems approach that leverages and integrates positivist, interpretivist, and constructivist tools of social science research can lead to better insight and policy critiques. The second chapter is a descriptive case study of a social accountability project seeking to decrease health provider demands that women make informal payments in Uttar Pradesh (UP), India. Women in UP are often asked to make informal payments for maternal health care services that the central or state government has mandated to be free. The chapter is a descriptive, contextualized case study of a social accountability project undertaken by SAHAYOG, an NGO based in UP. The study methods included document review; interviews and focus group discussions of program implementers, governmental stakeholders, and community activists; and participant observation in health facilities. The study found that SAHAYOG adapted their strategy over time to engender greater empowerment and satisfaction among program participants, as well as greater impact on the health system. Participants gained resources and agency; they learned about their entitlements, had access to mechanisms for complaints, and, despite risk of retaliation, many felt capable of demanding their rights in a variety of fora. However, only program participants seemed able to avoid making informal payments to the health sector; they largely were unable to effect this change for women in the community at large. Several features of the micro and macro context shaped the trajectory of SAHAYOG’s efforts, including caste dynamics, provider commitment to ending informal payments, the embeddedness of informal payments in the health system, human resource scarcity, the overlapping private interests of pharmaceutical companies and providers, and the level of regional development. Though changes were manifest in certain health facilities, as a group, providers did not necessarily embraced the notion of low caste, tribal, or Muslim women as citizens with entitlements, especially in the context of free government services for childbirth. SAHAYOG assumed a supremely difficult task. Project strategy changes may have made the task somewhat less difficult, but given the population making the rights claims and the rights they were claiming, widespread changes in demands for informal payments may require a much larger and stronger coalition. 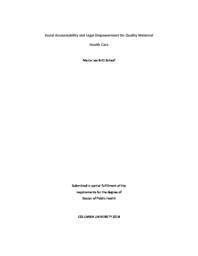 The third paper is an explanatory case study of a hybrid legal empowerment and social accountability effort led by the Mozambican NGO, Namati Moçambique. Established in 2013, Namati Moçambique runs a multi—pronged health paralegal and policy advocacy program that employs community paralegals as Health Advocates and trains Village Health Committees (VHCs). The study sought to uncover how the program affected the relationship between citizens and the health sector, how the health sector and citizens responded, and what role contextual factors played. The case study had two components: 1) a retrospective review of 24 cases 2) qualitative investigation of the Namati program and program context. The cases came from a total of 6 sites in 3 districts. Program implementers, clients, Village Health Committee (VHC) members, and health providers were interviewed or participated in focus groups as part of the research. The study found that though they are unable to address some deeply embedded national challenges, Health Advocates successfully solved a variety of cases affecting poor Mozambicans in both urban and rural areas. Health Advocates took a variety of steps to resolve these cases, some of which entailed interactions with multiple levels of the government. We identified three key mechanisms, or underlying processes of change that Namati’s work engendered, including: bolstered administrative capacity within the health sector, reduced transaction and political costs for health providers, and provider fear of administrative sanction. In addition to case resolution, stakeholders highlighted individual satisfaction at having one’s complaint remedied and individual empowerment among clients and Health Advocates as stemming from the project. Health Advocates and VHCs developed functional working relationships with providers, in part because they addressed issues that providers felt were important, and engendered community satisfaction with the Health Advocate, and ultimately, trust in the health system. The case resolution focus of legal empowerment brought procedural teeth, helping to ensure that new relationships result in immediate improvements, thus instigating a circle of relationship building and health system improvements.